Evel was a self-made American original. The jump over the Caesars Palace fountains put him on the map, and in a coma for 29 days. 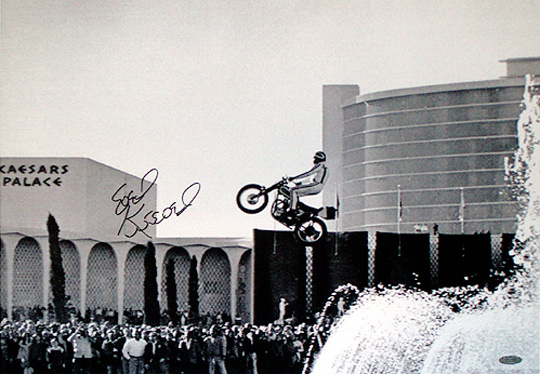 After doing his normal pre-jump show and a few warm up approaches, Knievel began his real approach. When he hit the takeoff ramp, he felt the motorcycle unexpectedly decelerate. The sudden loss of power on the takeoff caused Knievel to come up short and land on the safety ramp which was supported by a van. This caused the handlebars to be ripped out of his hands as he tumbled over them onto the pavement where he skidded into the Dunes parking lot. As a result of the crash, Knievel suffered a crushed pelvis and femur, fractures to his hip, wrist and both ankles and a concussion that kept him in a coma for 29 days.